After a decade and a half away from America’s Cup competition, the New York Yacht Club , represented by Bella Mente Quantum Racing Association, is getting back into the game for the 36th Cup, to be held in New Zealand in early 2021. 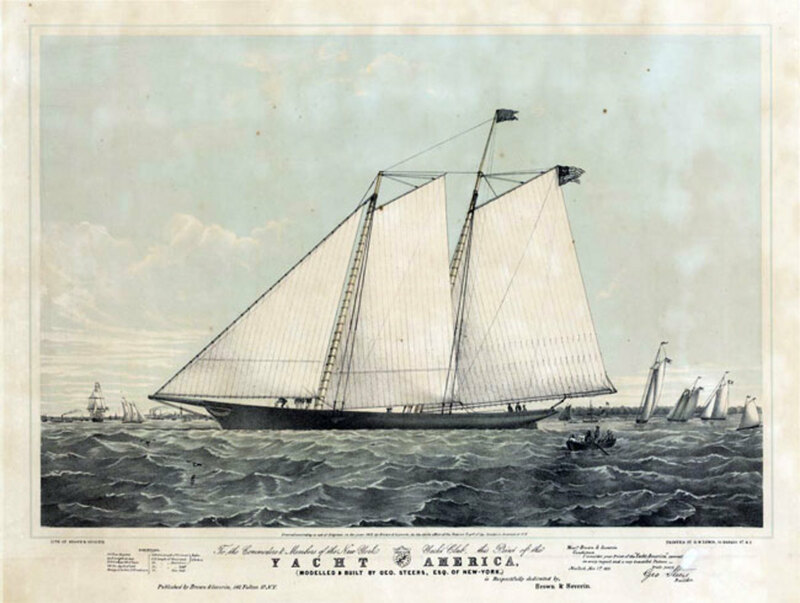 The New York Yacht Club held the “Auld Mug,” as it’s affectionately known, from 1851, when it was won by the legendary schooner America, (shown above) through 1983: a run often known as the longest winning streak in sports. The club regularly challenged for the trophy in the years that followed the historic loss to Australia II off the coast of Newport 34 in 1983, but had remained on the sidelines since its last challenge with Team Dennis Conner for the America&apos;s Cup in 2002-2003. The challenging syndicate will be led by two of the most successful American yachtsmen of the last decade: John J. "Hap" Faith (Naples, FL) and Doug DeVos (Grand Rapids, MI). Since 2005, at the helm of three successive yachts named Bella Mente, Fauth and his team have reached the top of the podium in numerous distance and buoy races at venues in North America, Europe and the Caribbean. Fauth is a three-time world champion in the Maxi72 class. For his part, DeVos, as part of the Quantum Racing program, has set the standard for excellence on the 52 Super Series circuit, and its predecessor, the MedCup, with overall series wins in 2008, 2011, 2013, 2014 and 2016. Also taking part in the effort will be Quantum’s Terry Hutchinson, a two-time Rolex Yachtsman of the Year and veteran America&apos;s Cup competitor. Hutchinson, like Fauth, is a long-time New York Yacht Club member. "The America&apos;s Cup has always remained close to the heart of the New York Yacht Club, even in the years where we didn&apos;t participate as a challenger or defender," says Commodore Philip A. Lotz. "For this cycle, a lot of elements have come together in the correct way for the club to enter another challenge. First and foremost is the desire of two great American sailors and businessmen, Hap Fauth and Doug DeVos, to take aim at sailing&apos;s ultimate competition. We know they will mount a competitive effort that is respectful of the club&apos;s long history with the Cup and the competition itself. Second, we have confidence the Royal New Zealand Yacht Squadron, represented by Emirates Team New Zealand, will host a world-class regatta that honors the spirit, tradition and majesty of this great event." Even though entries won&apos;t officially open until January 1, and the class rule for the new AC75 monohull (which will replace the ACC50 catamarans used in Bermuda this past spring) won&apos;t be finalized until March, there are many pivotal decisions that the team will need to start working on immediately. That said, with the return to monohulls the hope is that the already existing technological resources of the two elite monohull sailing programs will allow their joint effort to get a jump on the competition. "The decisions we make over the next six months will play a significant role in determining the ultimate success of our campaign," says Hutchinson, who sailed as tactician for Emirates Team New Zealand in the 2007 America&apos;s Cup match, the last to be contested in monohulls. "The early support of Hap, Doug and the New York Yacht Club puts us in a very strong position. But we can&apos;t take anything for granted. The race for the 36th America&apos;s Cup has already begun." For more on the effort, go to https://www.nyyc.org.